A strange and lonely business, lighthouse keeping. And one with a crushing burden to bear. It does not help when ghost ships appear out there on the waves to whisper up to the bleak towers of past disasters. What are lighthouses, but an attempt to warn mariners away from error, to focus the concentration of a weary sailor who has almost made it to land, to prevent fatal, irreversible mistakes. For who would drive a ship onto the sands on purpose? The Goodwin Sands is a ten-mile sandbank which guards the narrowest part of the English channel. It lies six miles off Deal, in Kent, and is guarded zealously by a great white light house which stands on the White Cliffs at South Foreland. It has claimed some 2,000 ships since records began, and countless lives. In February 1748, a schooner continued its journey to Portugal, past the white cliffs. The captain, John Reed, had just married a beautiful wife. He had brought her along for a honeymoon. And her mother. And all the wedding guests. It was to be a jovial voyage, his first as a married man. It was perhaps unwise to bring the first mate along. For John Rivers had always held a candle for the bride. Indeed, he was passionately jealous. Just how much his captain knew of this is uncertain, but Rivers’s actions revealed he would go to any measures to put an end to the happy couple’s future. It is said that as the ship neared the Goodwin sands, something in Rivers snapped. He unhitched a huge belaying pin – something which secures rigging – and bludgeoned the helmsman’s skull until he fell from his place at the wheel. And then Rivers took charge, steering the Lady Lovibond hard over until with a sickening crunch, it hit the sands. That sound must have reverberated upwards to William Knott, posted in the lighthouse. One never forgets the sound of a tragedy. It seems obscene that the sounds of everyday small mishaps like the dropping of a glass or the breaking of a box can be shared by the great life-shattering events, by a great wrecked ship disintegrating in the forces of a lawless sea. Poor William. to hear the cries and be able to do nothing. His only weapon was his light, back then in 1748. Every 50 years, it is said, the ghost ship sailed again, out there in the English Channel. William was the first of a dynasty of lighthouse keepers who became more potent as technology came to their aid. The Knott family is one of three famous lighthouse keeping families in Britain. The other two are the Darlings (of Grace Darling fame) and the Halls. The three families intermarried, and shared the trade and the expertise and the crushing responsibility. William would not live to see the wonders of the modern world, but his descendant, Henry Thomas Knott, lived on at the light house until 1877. This lighthouse is special. It was here they first tried out electric lights; here that Guglielmo Marconi experimented tirelessly to send messages to France using radio waves; and here that the first ship-to-shore distress message was sent after a steam ship ran into the lightship at Goodwin. The lighthouse at South Foreland closed in 1988. And yesterday, as the mists closed in over the channel, we went to see it. A lovely pale Victorian sentry, it almost blended with the mist. Its interior uncompromisingly utilitarian, I can only conclude that lighthouse keeping women did not deem decor necessary, in the face of all this life-saving. It is far away from everywhere, from towns and villages, down a gravelled track to the cliffs. The wind whistles round its head and it holds its own. It’s a strange and lonely business, lighthouse keeping. Posted in Places to visit, Quirks of HistoryTagged boats, goodwin sands, lighthouse, sailing, South Foreland LighthouseBookmark the permalink. What an incredible picture that must be! I’d love to track it down! I’d love to spend time living in a light house…A dream of mine!!! Hi Lisa: a beautiful situation, but a lonely one, I suspect. Lighthouses have always had a wonderful appeal to folks living on the coasts. Great history, exciting stories and just a perfect symbol for singleness of purpose. In Charleston, SC we have an old lighthouse that is now partly under water at high tide. There is a concerted effort to bolster its defenses and find ways to build a protective wall around it. It is the Morris island Lighthouse and a photo below. You’ve taken your boat out there, haven’t you, Lou? It is a pretty trip when the sea isn’t too choppy. Oh yeah, we have been there many times, but, we take the log way around via Folly and Lighthouse Creek. Going outside the harbor is a bit much for me and my little boat. OOPs, make that the “long” way around. Of course, a good old log roll would be fun, too. Oh, that’s a classic, Lou: remnds me of the one on Plymouth Ho: here. How poignant that Charlestone’s is gradually being subsumed. There is no thought of moving it, then? Very much, IE: at the sharp end of living, I’d say. You write so beautifully and on such interesting topics, thank you. The pictures are great as well, especially the last one. Thanks, Marco! This lighthouse was a gift. So dramatic. Lighthouse keeping is lonely but strangely romantic. It is. I wonder if it remains romantic when you do the job? Why are some lighthouses taller than others? Ours tend to be taller where we are. Is it because of the terrain? Hmmmmm. I shall go exploring. This is the only lighthouse I’ve ever been inside, but it was much more “squat” than those I’ve seen on the Southeast coast. It is pristine, Tandy. That’s the National Trust for you. Such a lovely and atmospheric post, Kate. I love to visit lighthouses and here the stories they have to tell. Well done. Thanks Penny. The place is a perfect writer’s prompt. Gorgeous spot. Thanks, Penny. They’re needed the world over, aren’t they? Is the structure from the 18th or 19th century? I agree that the interior looks uncompromisingly utilitarian, but was it also renovated in the 20th century? It would seem quite a challenge to maintain concentration if lighthouse keeping. No way could I have done in day in and day out. This is 19th century but there has been a lighthouse there since at least 1703 I believe, Lameadventures. Your comment reminds me of the Dickens story, the Signal Man. Have you ever read it? Hm. Sad story, but great photos! It’s a place I feel sure you’d enjoy, JG. As I said in my comment to Andra, the lighthouse at Point Loma, CA is the only one I’ve ever toured. Lots of photos of it here, including some of the interior, that recreate how the lighthouse keeper and his family once lived. Like a couple of your other readers, I think that (so long as the lighthouse was close enough to civilization for a break now and then) it would be quite a romantic way of life. Much Better Half is fascinated by the three families. Lighthouses are interesting, indeed. We have two within some five minutes’ travel in opposite directions. The most remote one we have ever visited, though, was on the island of Basaruto, off Mozambique. The keeper seemed delighted at the opportunity for a chat, even though we had rather a language barrier! I remember that en route there we crossed over a beach which wasn’t white like all the rest, but black. The reason became apparent when we got to it. Wall-to-wall crabs! Thousands upon thousands of them. They retreated just far enough to give a narrow pathway through. Oooh, that’s a bit Indiana Jones, Col! Super post as always, Kate, informative and sad and haunting. A very sad and tragic story about the fate of Lady Lovibond, and a very lonely but necessary business of lighthouse keepers. Thank you for sharing. You’re welcome, Judy. It was time for a tarn today. Don’t know why I grew up with the idea that all lighthouses are tall, cylindrical structures. Most of the ones I’ve seen, like this one, are not, and no two have been the same. About the only feature they have in common is the light. …and even that has changed since the days of oil lamps, PT…. Makes me think of the poem Flannan Isle by Wilfrid Wilson Gibson. 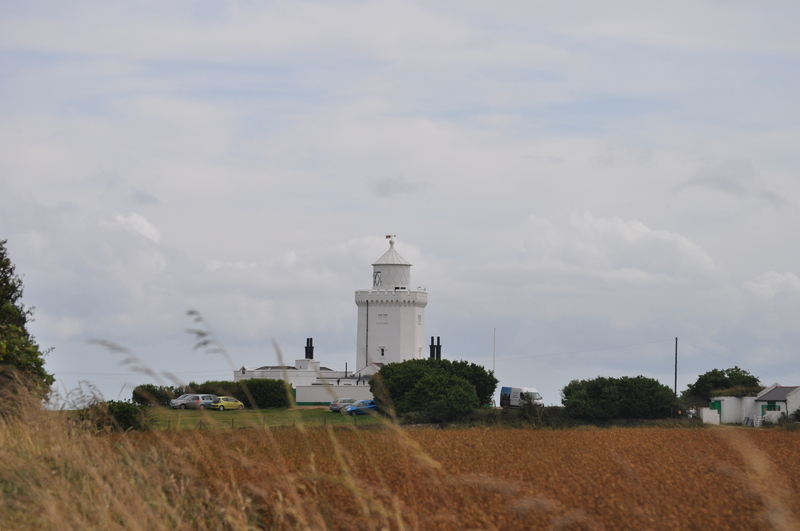 Nowadays, Marconi’s heirs in the form of Amateur Radio operators often transmit from beside old and current lighthouses as part of the Lighthouses on the Air programme. There is an International Lighthouse Lightship Weekend every year in the middle of August. There used to be an annual Cricket Match on the Goodwin Sands! It’s always inspired the grim, Martin- it’s a wonderful poem, thanks for reminding me of it! My dad has told me about transmitting from unusual sites. I had no idea there was a lighthouse project though!